Renowned auto racing promoter Ernie Moross made much of entering "Wild" Bob Burman to drive one of his two new Benz imports for the first Indianapolis 500. This should have come as no great revelation to those who were paying attention, but it was classic Moross to make something sensational out of the expected. Burman and Moross had been working together for months. It was Moross who hired Burman to drive the "Blitzen" Benz to a land speed record (on Daytona Beach) of over 141 mph that spring. 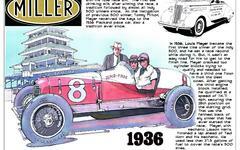 This was the same car Oldfield had used to break the land speed record, again at Daytona, one year earlier. The Blitzen Benz was too big for the Indianapolis Motor Speedway's car specifications, but the new Benz was the right fit. This article, published May 4, 1911 in the Indianapolis Star is a great backgrounder for anyone researching Bob Burman. Moross was the former director of speedway contests at the Indianapolis Motor Speedway who had left during the summer of 1910. There is no way of knowing for sure, but it would not be baseless to speculate that he had a rift with Speedway President Carl Fisher.